Some people are natural packers. I call it Tetris syndrome, and my boyfriend has it in spades. Whenever he loads the dishwasher or arranges the freezer, everything has to be fitted just so for maximum capacity, although it’s not necessarily the most practical or efficient. Deadlock Puzzle was designed for people like him, where there’s a place for everything and everything in its place. The game is very simple and mechanical in concept. You have a large puzzle board and pieces with various circles, squares, and X’s on them. The goal is to match puzzle pieces with their corresponding symbols on the board and fill in all of the spaces. It sounds easy, but most pieces can fit in numerous places, so it takes a fair bit of strategy to figure out exactly the right place. There are 15 levels, and it doesn’t take long at all before getting everything set is a serious challenge. To play, drag the pieces from the inventory down to the board and tap with a second finger to rotate. If you try to put a piece in a place it won’t fit, it will snap back to the inventory at the top. Swipe along the inventory to see the different kinds of pieces. The inventory will also tell you how many pieces of each kind you have left. There is no time limit, but there is a timer and a local high score board to keep track of your best games, but there are no online leaderboards. Visually, Deadlock Puzzle isn’t the most inviting of puzzles, since it’s very basic with a decidedly stark, industrial feel. There is also no music and sound effects are on the minimal and occasionally jarring side, but the touch controls are perfectly adequate, and piece rotation works much, much better than I’ve experienced in other puzzle games, like Chromixa. The overall package is a little lackluster, but the puzzles themselves are a solid and satisfying challenge. It’s a piece of cake to get the hang of things, and the interface is clean, clear, and easy to use, if not the prettiest around. I can’t say I love the game, but it is definitely a respectable piece of work. 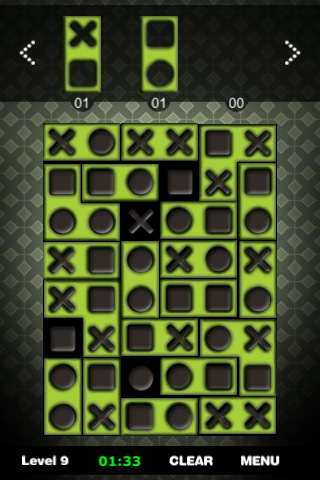 If you suffer from Tetris syndrome, but you want something a little more slow-paced that you can really dig your teeth into, Deadlock Puzzle is a perfectly decent and affordable option. AppSafari review of Deadlock Puzzle was written by Tracy Yonemoto on May 30th, 2010 and categorized under App Store, Games, Puzzler. Page viewed 4808 times, 3 so far today. Need help on using these apps? Please read the Help Page. Love your review of this game, I actually bought it too! Thanks for the best review site on the planet.